Services will be 10 AM Friday at First Indian Baptist Church, 2610 S. Broadway Ave, Moore, OK with burial to follow in the Moore City Cemetery. Richard, 78, of OKC, passed away June 1, 2018 at his residence with his family by his side. He was born in San Antonio, TX to Jacinto and Ramona (Flores) Trevino. Richard worked many years, until his retirement, as a foreman for Southwestern Roofing and Sheet Metal. 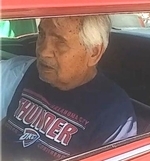 He loved his family dearly and in his spare time, he spent most of it with the grandkids and working in his shop, on his 1955 Chevy that he was very proud of. Richard was preceded in death by his parents; his first wife and mother of his children, Jennie Mae Trevino and a sister, Dolores Martinez. He leaves behind his wife, Virginia; sons, Charles, Michael and Jason Trevino; daughter, Cynthia Trevino; grandchildren, Vincent, Marcella, Tristen, Michlan, Tanner, Isabel, Mandi, Jennifer and Michael Aiden Trevino; great grandson, Christopher Trevino; 2 sisters, Margie Vogt and Ramona Montoya; 3 Brothers, Pete & Joe Trevino and Rudy Gomez; and numerous nieces and nephews. To send flowers to the family of Richard Flores "Ray" Trevino, please visit our Heartfelt Sympathies Store.